Meet our new favorite side dish! 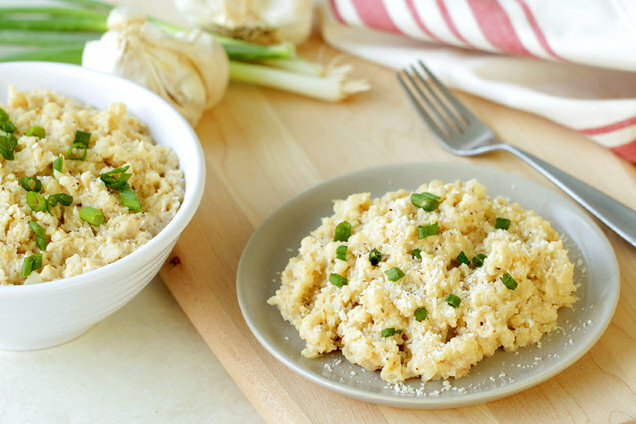 This creamy, cheesy, buttery cauliflower rice dish will absolutely blow your mind. It tastes insanely decadent, yet it's a complete calorie bargain! In a medium bowl, combine cream cheese, 2 tbsp. Parm, butter, garlic, onion powder, salt, and pepper. Stir until mostly smooth and uniform. Bring an extra-large skillet sprayed with nonstick spray to medium-high heat. Add cauliflower and 1/4 cup water. Cover and cook for 6 minutes. Uncover skillet. Cook and stir until water has evaporated and cauliflower is tender, about 2 minutes. Reduce heat to medium low. Add cream cheese mixture, and cook and stir until cheese has melted and coated cauliflower, about 1 minute. Before serving, top with remaining 2 tsp. Parm. Hungry for More Cauliflower Rice Recipes? Help your pals keep their dinner routine interesting! Click "Send to a Friend" now.